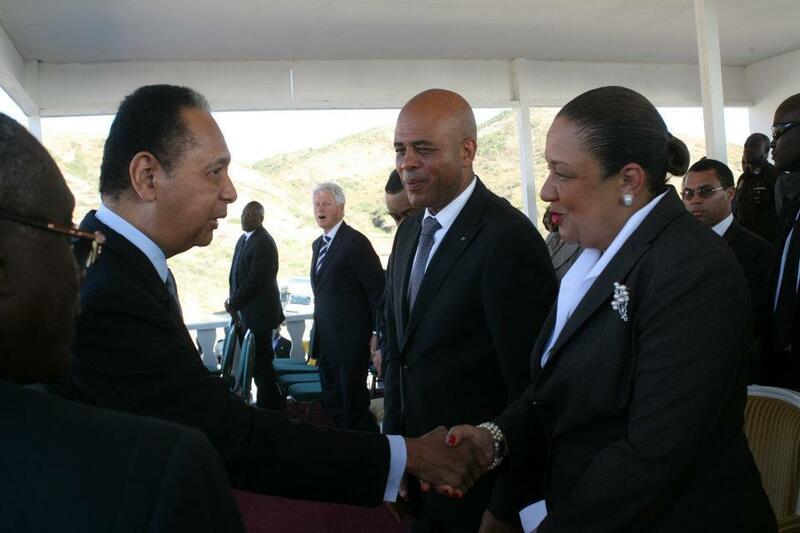 HAITI’S “DEMOCRATIC DICTATORSHIP”: Bill Clinton is comfortable shaking hands with “Baby Doc” Duvalier – Why? A young Haitian called me the other day insisting that I help him deal with the disturbing photograph he had just seen on the internet. By then, my friend had realized that it was not a photoshop manipulated fake image. 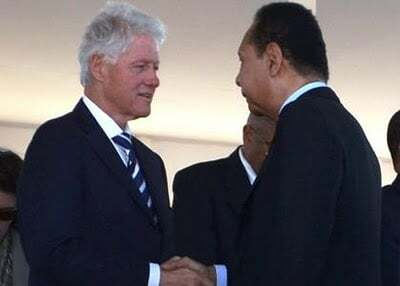 Thus, he wanted to understand why former U.S. President, William Jefferson Clinton was smiling and shaking hands with Jean-Claude Duvalier in Titanyen….on January 12, 2012, at the very site where mass graves were dug to pack hundreds of bodies of men, women and children who were murdered by Jean-Claude Duvalier and his infamous Tonton Macoutes – over the course of 3 decades of a notoriously brutal dictatorship. I tried then to help my young friend….but, now, having had a few more days to deal with my own shock, I would like to share further insights on the matter, via this forum thread. capital of Port au Prince before he stands trial for crimes against humanity including political murder and torture. (note: Bill Clinton is in background with jaw agape as Martelly greets Duvalier). They know exactly what they are doing: “shock and awe”! Clinton’s fake humanitarian persona is something the US creates for its former presidents to help them achieve strategic political and economic goals. Back in 1990, following the first democratic elections, the late great Antoine Izméry – a Haitian of Palestinian descent whose courage and patriotism needs to be emulated in our time, informed the nation that the U.S. sent their former president Jimmy Carter to Haiti to try to convince the candidate who had fairly and squarely won the election (by a wide and indisputable margin) to relinquish his right to be sworn in as President of Haiti and to let the U.S. puppet of the day take over instead. Jimmy Carter’s well-financed “humanitarian” identity is what they banked upon to have such blatant imperialist, racist and frankly barbaric intervention pass without suspicion. The Haitian people resisted then and are still paying the price now (References: http://www.iacenter.org/haiti/carter.htm http://en.wikipedia.org/wiki/Antoine_Izméry The model is still being used today with Monica Lewinsky’s friend. Somehow, this white man has more credibility, more moral standing than 10 million Haitians, among whom not a single woman or man could be found worthy of heading a so-called Haiti Reconstruction Fund. Somehow, Monica’s friend is deemed more “trustworthy”!? This is what some term the “TARZAN syndrome”. Unfortunately, even so-called leftist white activists sometimes fall into that trap of wanting to speak for or on behalf of full grown black men and women who simply want and deserve their solidarity (not paternalist obstruction) in a just cause. But, often times, the white activist simply cannot bring himself or herself to follow directions from non-whites – even when the issue they are dealing with concerns the lives, the experiences of non-white people, they prefer to create a ghetto of their own and echo their own voices. See also: Has Sean Penn been recruited by Jean-Claude “Baby Doc” Duvalier? So, there is a larger context for the blatantly outrageous behaviour of Bill Clinton, as well as many other tarzans in Haiti. It is no excuse for him or them but rather a contextualization that may help us better deal with the core of the problem at hand. Otherwise, these self-absorbed fools will continue to hold meetings to congratulate themselves while our peoples die of hunger in resource-rich KMT (aka Africa) – while Bono makes his fans dance all night long to “save Africa”- Live from Toronto!….and Monica’s friend plays the great moral arbitrer in Haiti. We must not simply shift but BREAK this stupid and outdated neo-colonial paradigm!